how to apologize well – Love. Life. Practice. “Love means never having to say you’re sorry.” – The most fallacious movie line in history. My parents worked really hard to create a happy home for us kids. Part of that was that I can’t remember any times that I ever saw them get into fights. A few disagreements, sure, and I’ve spent enough time with my own temper to recognize now the times when my Dad was probably boiling mad – but he never actually let it show. Neither of them did; they presented a united front to us kids. In a way, I wish they hadn’t. When, in the course of my own relationships, my partner and I would get into an argument – or worse, a fight (non-physical) – it seemed like the end of the world. 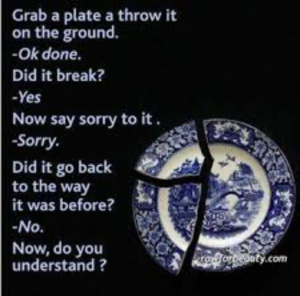 This is not the way good relationships work, I would think, and either decide I was doing something wrong, my partner was, or the relationship itself was to blame. It took a long time and a veritable wasteland of broken hearts and abandoned love before I started to understand that people can love each other but still disagree. That you can have an argument and it doesn’t mean the relationship was over. That it was worth working through things, and that my roaring adrenaline and shining self-righteousness was just a symptom that would pass, and it was worth riding it out and coming back to whatever the isssue was when I was done. One of the biggest parts of this was learning how to actually apologize. Do not follow “I’m sorry” with “if” or “but” or “that you”. This is about you. If you qualify it with “if” then you’re actually not admitting anything happened. “But” simply justifies your action, nullifying the apology. “That you” shifts the cause to the person you’re talking to. Keep it first-person. If you have to say something after “I’m sorry” then make sure it’s ”…that I…” and state your contribution clearly. Look for Patterns Why did this happen? Is it part of a bigger picture, a behavior, a habit, a past trauma? Is it part of some personal quality you can develop or change? Figuring this out can turn this unfortunate incident into a simple stepping stone towards further growth. At least, that’s how it’s worked for me. How about you? How have you learned to get through those rough patches? AAHHHHHH! Open parenthesis and no closed parenthesis!!!! Ahem. Just thought you should be notified. I apologize for my punctual error, and have taken steps to both fix it and also reminded myself to take the time to copyedit more carefully before hitting “post” in the future. I also must admit I was tempted to reply to your comment with one character: “)”. While making most of your article a parenthetical aside and taking the wind of the sails of some very good points, I would have nonetheless still felt the same sense of relief. Whew. All joking and programmer panic aside, this article hit on some very important areas of relationships. I, too, had no idea what to do with anger. I still struggle with it, with my own anger, with my partner’s anger. My parents never showed it, never dealt with it. It was quite refreshing to have it NOT be the end of the world when I got mad. It’s okay for me to be mad? It’s okay for you to be mad? You aren’t going to leave and never look back because you’re angry with me? That is a shift, I admit, I still struggle with. I’m glad I’m not the only one. My go to is to just accept all of the blame, apologize (something at which I excel), and push down any righteousness. This, naturally, has gotten me into trouble before, thankfully my partner doesn’t let me get away with that. So we’re figuring it out. Together.